Sam had a lot of fun creating the mottled watercolour paper that we used for this leaf bunting, watching how the colours mixed together. Make sure you put down plenty of plastic sheeting before you start this craft! Water down the paints so they are very runny. Drop the paint on to a sheet of kitchen towel and watch the colours run and mix. When you have painted as many sheets of kitchen roll as you like leave them to dry. Cut leaf shapes out of the dry kitchen roll sheets. Use a hole punch to puch a hole in each leaf. Thread on to wool or ribbon and hang. This interesting technique relies on art tissue paper, which "bleeds" when water is added and produces a lovely mingled effect. Children enjoy watching the colours bleed into each other and the finished result is a perfect leaf for autumn. 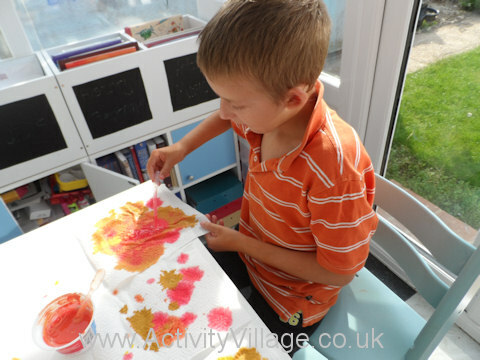 Learn about mixing colours and create a pretty autumn display with this fun painting craft. We've lined up our leaves across a strip of card to make a display, but you could hang them in graduating order too. Use a lovely leaf and some twigs collected when out walking and turn them into a picture of an autumn tree with this fun stamping craft. Scroll down to see what the leaf looks like when it is ready to make the print - such fun!